Fly like a bird above the Grand Canyon, along with nearby attractions such as the Hoover Dam, during this 45-minute helicopter flight from Las Vegas. Lift off from the helipad in your state-of-the-art chopper, enjoying breathtaking views above the West Rim of the world’s most incredible canyon, along with the immense Hoover Dam and the scenic Lake Mead and Colorado River. On the trip back, you’ll also hover for a short time over the glimmering Las Vegas Strip. This amazing ride also includes insightful narration from your pilot as you ride, plus bottled water. Upgrade your flightseeing experience to include a basin landing, Champagne and transportation by limousine on this popular helicopter tour! An ultra-fast, budget-friendly way of seeing the Grand Canyon for those staying in Vegas. See the world’s most incredible canyon from above as you enjoy a breathtaking 45-minute helicopter ride from Las Vegas to the Grand Canyon, flying over nearby sights such as the Hoover Dam, Lake Mead, and the Colorado River on the way. Anyone looking to maximize their sightseeing time during their Vegas trip will appreciate this amazing helicopter ride to view some of the Southwest’s top natural and man-made attractions. Start your flight with either a morning or afternoon arrival at the heliport near the Las Vegas Strip (depending on the option selected). 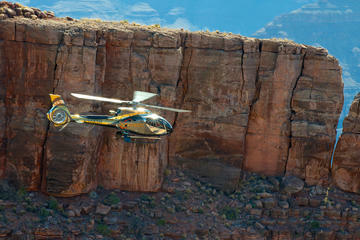 Then strap into your sleek, modern A-star helicopter as you take off for the short flight to the Grand Canyon. Glide above the canyon-strewn landscape of the American Southwest, passing over iconic sights such as the Hoover Dam, the Colorado River, Lake Mead, and several extinct volcanoes, heading to your final destination. As you fly, your pilot will provide interesting narration about the sights you pass on the way. Soon you’ll arrive at the West Rim of the Grand Canyon, considered by many to be one of the most jaw-dropping natural sights in the world. Spend the next 40 miles (64 kilometers) buzzing over the edge of this superlative-worthy canyon, snapping a few aerial photos as you fly. Soon you’ll head back toward Las Vegas, turning for one more sky-high pass above the city’s famous Strip of neon-lit casinos, before touching down at the heliport to end your excursion. Due to comfort and weight / balance of the aircraft, passengers weighing over 275 lbs (125 kg / 19.5 stone) will be required to purchase an additional seat. This is payable directly to the tour operator on the day of the tour.